Getting back to this particular favorites post series, we have the third of the four aces, the Ace of Wands. The wands suit is typically depicted, in those decks that use elemental associations, as associated with fire - the light, the burning energy, the passion that the cards within it often speak to. This Ace, like the others, is about new beginnings and opportunities, yes - about those involving creativity, self-fulfillment, ambition, drive. This Ace calls for action in the post literal, direct sense: go, do, create, be brave. It is about potential ready to be worked, shaped. Though many decks utilize elemental associations and imagery in their depictions of the minors, few, I think, do so as neatly as Robert Place's Alchemical. I especially like how the theme of the animals continues through the suit - the baby salamander in the Ace reappears, majestic and grown, as the wand's King. The salamander makes a rather good metaphor for the Ace in general - here it is small and newly born, but already we can see the hints of its future power, the way it lays on a bed of flames at the wand's base. The tip of the wand burns too, of course, illuminating the space. I find the clover sprouting out of the side a very nice touch. A clover for luck, a sign that now is indeed the right time for whatever this card is speaking to, that the universe is on your side; and at the same time, a reminder of the idea of making your own luck, the need to act, to take advantage of the opportunities that present themselves to you. The line work and coloring here is awesome, the palette perfectly suited. Can it be, one might ask? 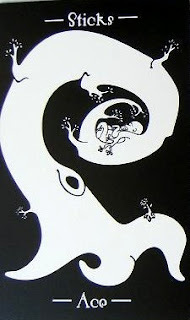 Can a black and white deck really manage to express all the energy and meaning that an Ace like this is meant to represent? The answer, as the Tarot of the Absurd here shows, is very much yes. Like just about all the cards is this lovely deck, the ace of wands has a certain playfulness to it, a touch of whimsy. Though it features a tree, something we usually associated with age, tradition, firmness, here we see it dynamic, in motion, sprouting new branches and, at the center of the image, curled around a newborn. Yes, the tree here moves and sways and curls so as to protect this creature, newly entered into the world, just formed, inexperienced. A beginning indeed, a wealth of experiences to be had, discoveries. The baby still sleeps but the tree does not, no. Nothing here is a passive act, not holding, protecting, caring. Everything requires deliberate effort, decision. What will become of them, this tiny babe, this almost dancing tree? Time will tell indeed. I drew and wrote about this card in my very first post on this blog, just a day short of exactly a year ago. At the time I was desperately scrambling to finish a rather long and important paper - rather the same as I'm doing now, come to think. Changes and beginnings and repetition. The deck was quite new to me then, and I was still trying to wrap my mind the rather unusual switch, of elemental associations and to a large degree meanings, of the wands and coins suits. Of all the switched up cards in the deck, this one perhaps makes the most amount of immediate, intuitive sense to me. 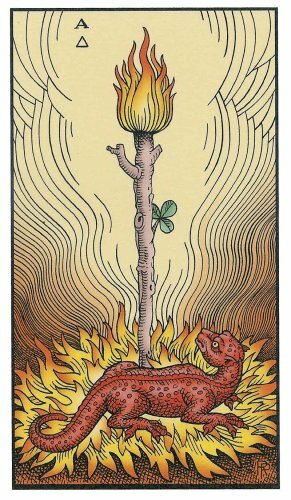 Why shouldn't the Ace of Wands be seen like this, a confident silhouette of what may be sprouting out of a plant, leaves and roots and vines supporting and pushing up. The green of the ground slowly turns to blue as we reach the top of the card, to sky, freedom, so much possibility there. We plant seeds in the ground, little kernals of perhaps, and wait and watch them grown into things to beautiful hey take our breath away, sometimes. And isn't that what this card can be, at it's best - the reason we see it and know we should go, try, take that risk?